On a recent trip to Colombia, I noticed something curious. As I traveled from north to south, the color of the rice with my meals changed dramatically. In Bogotá, situated on a plateau near the Andes, the rice served was regulation opaque white. Whereas in Cartagena, on the Caribbean, the rice was almost always a mottled cinnamon brown—and quite delicious. The color difference has nothing to do with milled versus unmilled. The explanation is right in the name: arroz con coco, or coconut rice. This style of rice is standard fare in Cartagena, a port city whose cooking incorporates flavors and ingredients brought from Africa and the Middle East. So how does coconut milk, which is white, make rice brown? The answer is titoté. This is the Spanish word for the leavings, or cracklins, produced by boiling down coconut milk till it renders up solid bits, as well as its own oil, that are allowed to fry till golden. Titoté is a flavor bomb: A properly made plate of coconut rice is unforgettably good. The rich, slightly nutty, faintly sweet taste pairs great with Colombian mainstays like grilled fish and stewed beef. Note the “made properly” above, because good technique is essential to making this dish. The key point to understand is there are “two milks”: the first—pure, undiluted coconut milk—makes the titoté; the second—diluted coconut milk—is the liquid the rice cooks in. You can make arroz con coco with actual coconuts, but good luck. My attempts so far have not met with success. 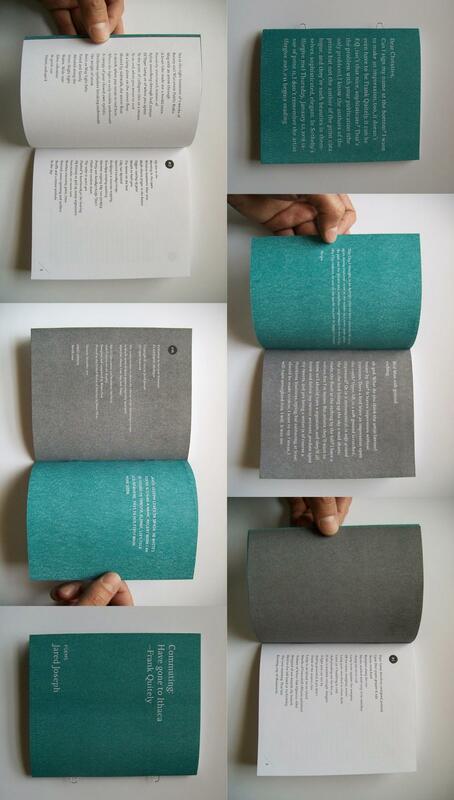 Twice, the flesh inside gave off a soapy smell and, in the finished result, an off-putting taste. Still, in the spirit of this column, I give instructions for using fresh coconuts in the Comments section. Meanwhile, don’t hesitate to use canned coconut milk. My happy results with it make me wonder if cooks in Cartagena aren’t reaching for the same stuff. Adapted from recipes by Teresita Román de Zurek, author of Cartagena de Indias en la Olla, and from My Colombian Recipes, an English-language blog written by a home cook from Medellín. Empty cans of coconut milk into a blender; blend on medium for 5 seconds to homogenize (you can do this in a bowl with a whisk if you prefer). Pour slightly more than 1 cup of the coconut milk into a heavy-bottomed saucepan; heat on medium-high. Note, the milk will sputter during cooking. Stir occasionally to make sure it isn’t scorching on the bottom. After 10 minutes lower heat to medium-low. Monitor it more closely and stir more frequently as it thickens. After about another 10 minute, watch it closely as the coconut oil begins to separate and the leavings begin to solidify. Lower heat to simmer and allow the leavings to darken nicely in the oil. Add rice to the titoté. Stir for 1 minute over medium heat. Add sugar and salt. Stir to mix. Remove from heat. To the remaining coconut milk in the blender, add ½ cup of water. Blend on medium for 5 seconds. Measure 2 cups of milk mixture and pour into the saucepan with the rice-titoté. Cook without lid for 15 minutes over medium-low. 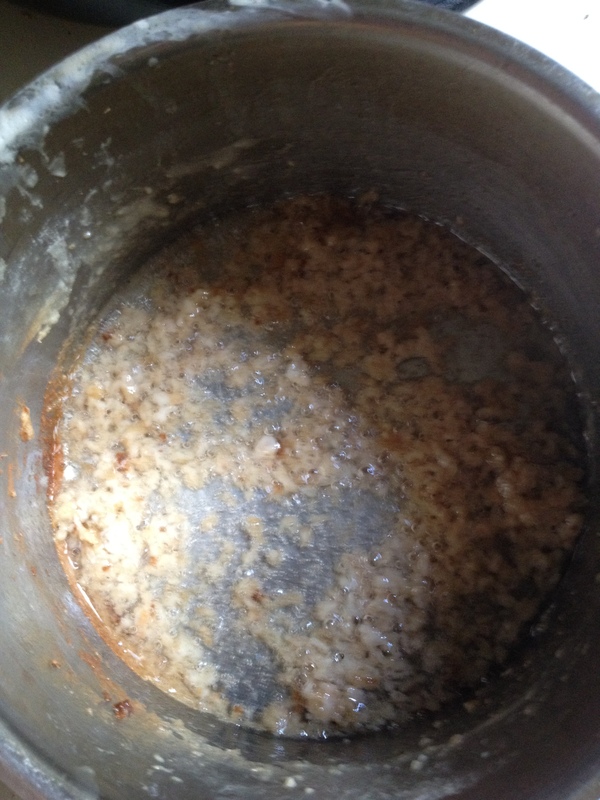 At this point, the rice should have absorbed nearly all the liquid (it can still be wet). If not, give it a few more minutes. When ready, cover pan with lid and turn down heat to very low. Cook 15 minutes more. Turn off heat. Remove lid and stir rice to distribute titoté and to scrape up bits of stuck rice on the bottom (this is desirable). Cover again and let rice sit for 30 minutes. This rest period improves the fluffiness. Stir again more before serving. Makes 4 servings. Time Consuming, Complicated Cooking! : Rattail Radish Pods for Dinner, Again?In "Columns"
Three poems by Sebastian ParamoIn "Poetry"
For the first milk: Stand the coconut so the black “eyes” face upward. Using a skewer or clean screwdriver, poke through the eyes. 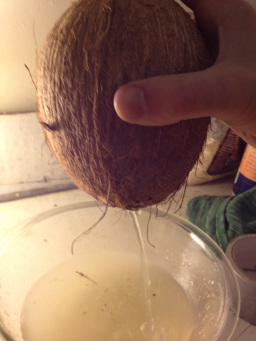 Drain the coconut water with a strainer into a bowl. Place coconut in a 350 preheated oven for 5 minutes. Remove and place in a sturdy bag and carefully thwack it with a mallet or hammer. The shell should break and the brief heating will have slightly separated the inner shell from the white meat. Remove the meat with the aid of a butter knife. Chop the coconut meat into chunks and put in a food processor or blender with ½ cup of water. Blend on medium to high till meat is grated and slushy (you may need to add a bit more water depending on how much meat you have). Add this mush to the bowl with the coconut water. Press the mixture through a colander to yield 2 cups. This is the first milk. Use this to make your titoté. For the second milk: Continue to drain and press the grated coconut (adding more water as needed) to yield 2 cups. This is your liquid for cooking the rice. Looking for the 888 ladies bingo login page - http://wildstarsslots.com.